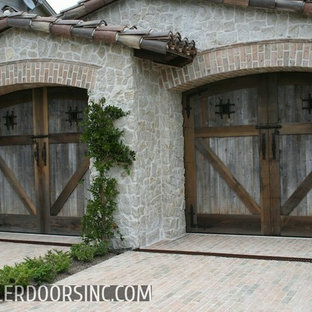 Reclaimed wood garage doors are taking on great popularity in Tuscan, Spanish, Mediterranean and even Modern garage door crafting. 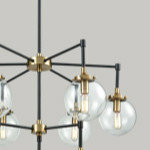 The reason for this rise in popularity is evidently because of the unique character that reclaimed wood has gained over the years of exposure to the elements, daily use and historical value. 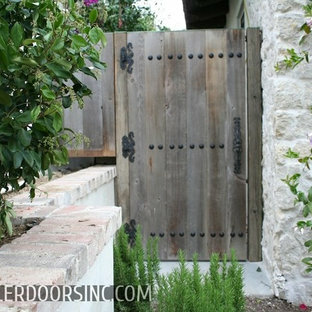 Additionally, reclaimed wood garage doors are ECO-Friendly and as we become a more environmentally friendly society in Los Angeles, re-purposing elements of the past instead of disposing of them is phenomenally gratifying. 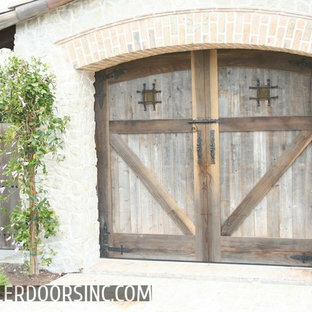 Take for instance this custom garage door with its authentic reclaimed wood not only has distinct character but it harmonizes with this Tuscan style home. Custom garage door designs are infinitely vast and Dynamic Garage Door can design, manufacture and install a custom garage door that suits your taste, your home's architecture and your role in saving the environment for tomorrow's generations! 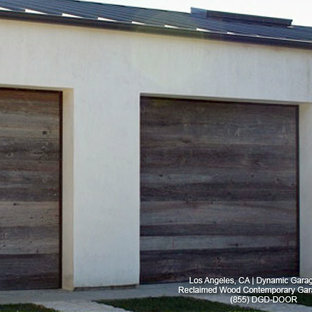 Los Angeles, CA - Contemporary architecture lends itself to create custom garage door designs that are interestingly unique. 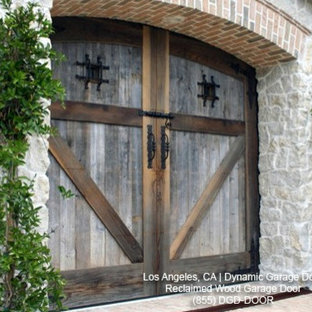 These reclaimed wood garage doors are not only eco-friendly but very appealing to the discerning eye. 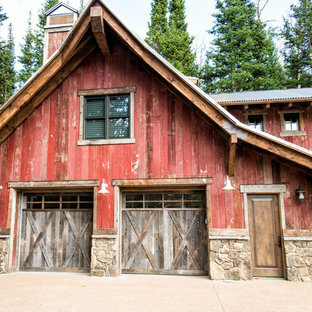 Re-purposing natural elements such as wood from an old barn can prove to be an outstanding design factor that makes a unique statement. These contemporary garage doors were ingenuously designed in a simple, minimalistic style that exemplify just how beautiful eco-friendly design can be as well as contemporary. Dynamic Garage Door custom designs contemporary garage doors in a variety of materials available today and why not make use of wood that would otherwise be tossed? We enjoy designing, manufacturing & installing garage doors that not only harmonize with the architecture of a home but that also tell a story in an eco-friendly fashion. Contemporary garage doors have established the style norm for numerous architects and home builders in the Los Angeles, CA region. 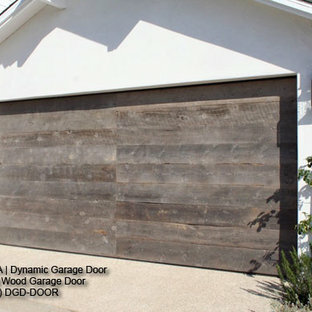 Fine lines and the re-purposing reclaimed lumber species are the latest ways to build outstanding architectural garage doors. Modern styles and innovative architectural designs; our contemporary garage door collection consists of custom wood garage doors, ECO-Alternative garage doors, steel &/or metal garage doors and aluminum garage doors with glass. 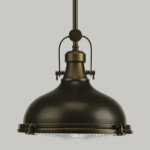 We work with architects, designers and contractors to establish new designs and bring life back to reclaimed materials that would otherwise be tossed! As the Mecca for architectural style and cultural diversity, Los Angeles has a wealth of architecture including French Country style homes. 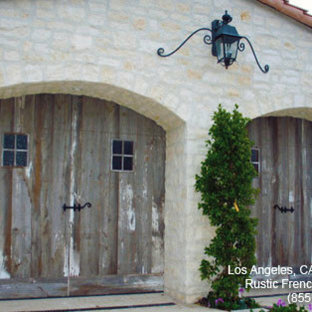 These customized French style garage doors are fascinating and their rustic French architectural design make them an outstanding feature of this french style home's architecture. 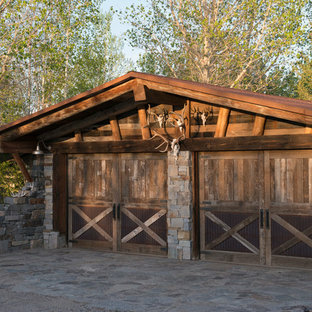 To design and manufacture unique garage doors like these, Dynamic Garage Door works with a multitude of wood species including reclaimed barn wood from around the world which, in this case, was used to custom design these French style garage doors. Our design expertise and our world-class craftsman manufacturing make our garage doors architecturally appealing. 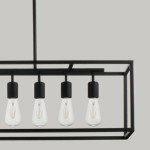 A steel "corner board" was used in place of the common wood corner board. The garage door was treated to blend with the house walls.